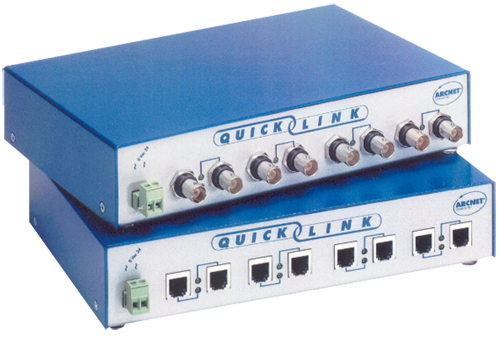 For an economical way of expanding ARCNET Local Area Networks (LANs), choose the QuickLink Series of fixed-port hubs. A hub allows you to add a segment and support distributed star topologies. These eight-port hubs use the same robust hub timing electronics found in Contemporary Controls' MOD HUB Series such as precision delay-line timing, digitally controlled timers for dependable operation and reduced bit jitter. A watch-dog timer stops hub lockup, eliminating the necessity of cycling power in case of transmission error. The QuickLink operates from low-voltage AC power (8-24 VAC), using a power supply featuring a full-wave solid-state bridge rectifier. Although nominally designed for powering from a 24 VAC source, this hub can also be powered from a 24 VDC source, irrespective of the polarity of the applied voltage, with no performance degradation. For the convenience of North American users, each unit is shipped with a wall-mount transformer having a 6' (2 m) low-voltage cord-so that it may work from 120 VAC mains power. The "-E" models for the European market are shipped without an external transformer, but transformer models are available to operate from the various 230 VAC European mains receptacles. Active hubs increase the robustness of ARCNET networks. They extend the distance possible on each cable segment-up to 2000 feet (610 m) on coaxial segments. These products block interference to the network by squelching reflections caused by open or shorted cable segments attached to the hub. Unused hub ports need not be terminated. Active hubs allow distributed star topology-thereby, reducing the cabling required in a facility. Two or more QuickLink hubs may be cascaded.